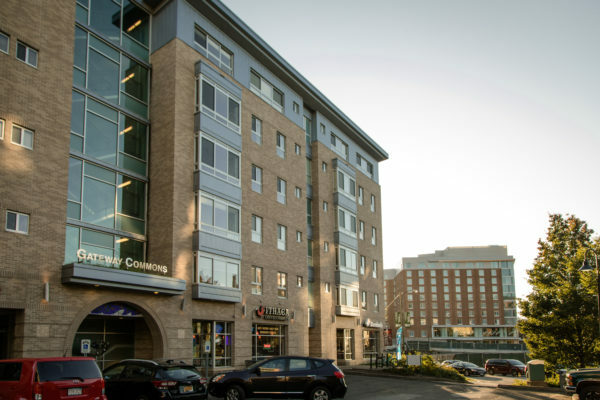 The Gateway Plaza site is within walking distance, less than two blocks from the Ithaca Commons, and offers guests a handful of fantastic dining options. Gateway Plaza and East State is another niche area downtown to explore at the east end of the Commons, offering visitors and residents a variety of mouth-watering dining and culturally-rich opportunities. Grab a couple of freshly baked pizza slices from one of Gateway’s two pizzerias Napoli or Domino’s, enjoy a barbecue or Southern-style dish at Gateway Kitchen, their pulled pork can’t be beat, and sip delicious coffee at Ithaca Coffee Company, that also has a taproom in back with free weekly craft beer tastings every Thursday and Happy Hour every Friday from 4:00 p.m. – 6:00p.m. Gateway is also home to the History Center of Tompkins County, our leading authority on the rich history of the county and region. The center is open to the public on Tuesdays, Thursdays and Saturdays from 11a.m. to 5 p.m.
A best kept secret, Gateway offers breathtaking views of the Six Mile Creek Nature Area, a dedicated pedestrian walkway that extends through Gateway Plaza and joins up at Coltivare on Cayuga Street. Across the street from Gateway Plaza is Downtown Ithaca’s newest boutique B&B, Argos Inn and Argos Warehouse, an event space. Housed in an impeccably renovated historic mansion, Argos Inn has 13 individually appointed guest rooms, each equipped with a private bath, a luxurious king or queen bed, and original works of art by both local and renowned artists. Innovative and historic cocktails are an absolute must-try in the world-class Bar Argos which is open 4:00 p.m.-10:00 p.m. daily. Just down the street, approaching the Commons, you’ll discover a connecting street teaming with activity and about to become a major hub of downtown living. On one side of the street, visitors will find more shopping and dining. The Community School of Music & Art, is an active spot each month exhibiting local art and music during Gallery Night each first Friday of the month. Just down from our local art school is Nikki Green, our newest plant-based, vegan eatery and Old Goat Gear Exchange, an outdoor apparel and gear recycler selling new and used together. Across the street, a brand new development, City Centre is rapidly taking shape and changing our city skyline. This latest development will house retail on the first floor, and apartment dwellings above.